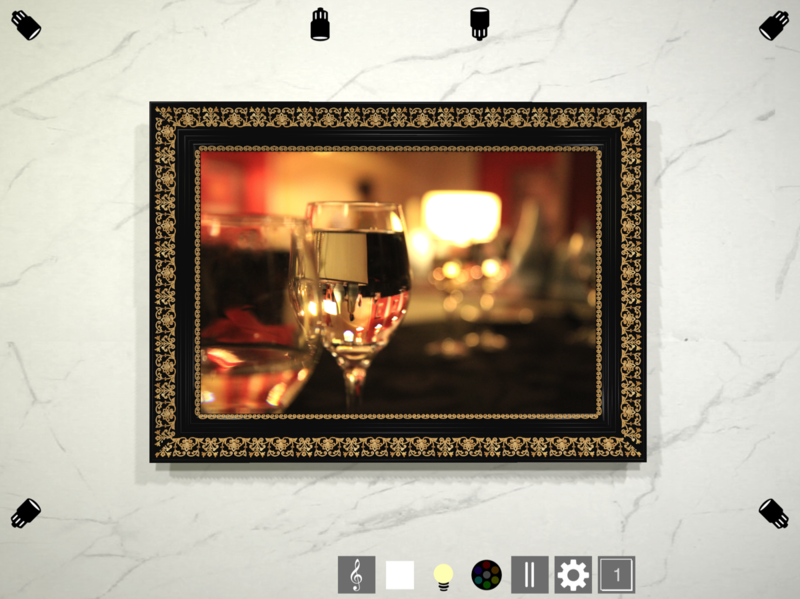 Frame pictures from the albums in your Photos and enjoy a slideshow of 3D framed pictures. If you are planning to get a photo or picture framed in real life, you can use the custom framing features of Pocket Frame to get a basic idea before you take your images to your local frame shop. 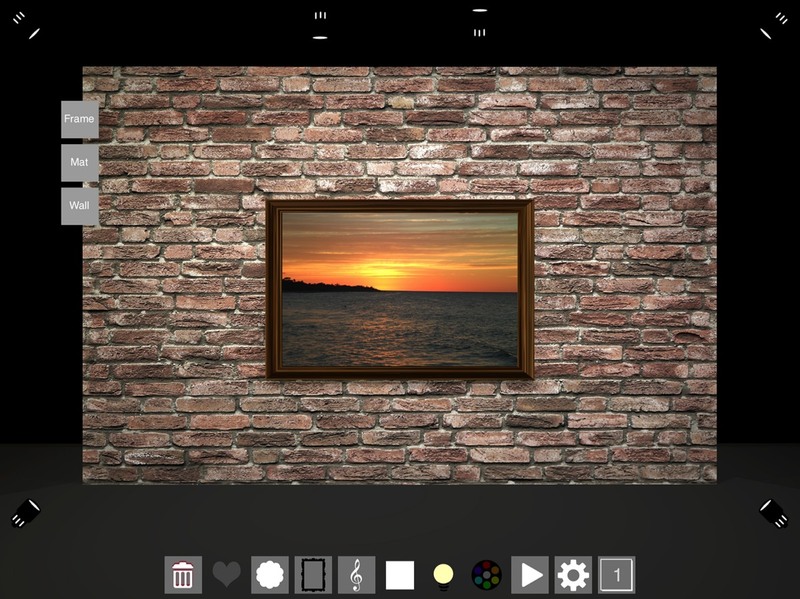 Pocket Frame utilizes the parallax effect to give your pictures a sense of realism. * A selection of frame styles to choose from. * You can change a frame's material and the colour of the inner mat. * The back wall can be changed to marble, concrete, or brick. * Adjust spot lights and floor lights to see different lighting effects. * You can select music from your music library to listen to as you enjoy your slideshow. * You can turn on and off lighting effects including snow, rain and bokeh. * Pick the colour of the lighting to set the mood for your pictures such as bright light for a beach photo or blue lighting for dramatic portraits. * You can zoom in, zoom out and pan around the pictures. - Tap the [Heart Icon] to save the current frame style and colour for the current picture. Tap again to un-favourite the selection and a random frame colour and style will be generated. - Tap the [White Square Icon] to turn on or off the Ambient light. Holding down the [White Square Icon] allows you to brighten or dim the light. - Pressing the [Circle Icon] turns on or off omni light. Holding down the [Circle Icon] allows you to change the colour of the omni effect lighting. - A quick tap of the [Multi Coloured Icon] will turn on or off background effects. Tap and hold the [Multi Coloured Icon] to change the background effects. Tap again to switch to the next option. Pick from rain, snow or bokeh. - Tap the [File Icon] to load a pre-set light setup. Tap and hold the [File Icon] to save to the current slot. - Press the [Trash Can Icon] to delete the current picture from the app. - Click the [Photos Icon] to access your Photos and a selected photo is copied to the app. 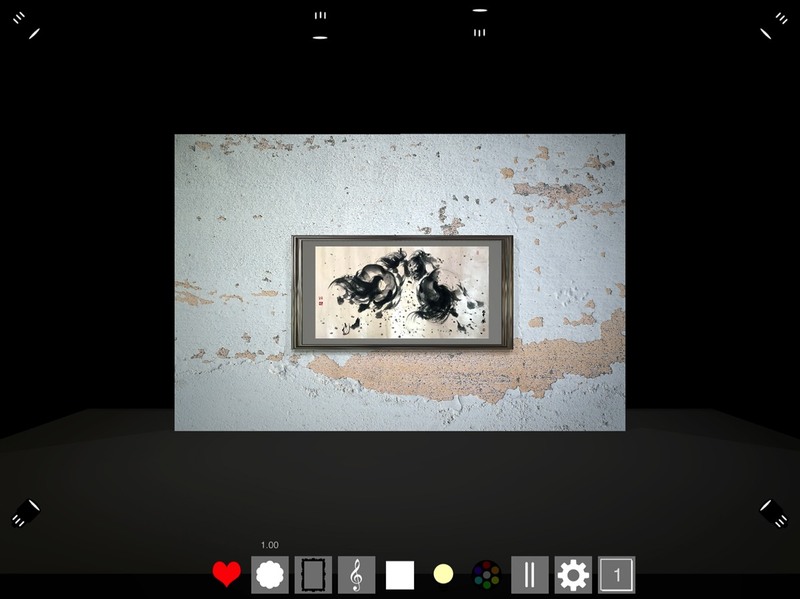 -Tap the [Frame Icon] to select the frame style for your current picture. Tap and hold the [Frame Icon] to change the frame or mat colour or the background wall. - Press the [Music Icon] to allow access to your music playlist to pick a song to play in the app. - Tap the [Play Icon] to play or pause the slideshow. You can only add or modify the slideshow when it's paused. Press and hold the [Play Icon] to change the play mode (shuffle or repeat all). - Press a light to turn it on or off. Hold down an individual light to either dim or brighten the light. - Try turning on and off a different combination of stage lights to highlight and add drama to the image.